In my first post for Learning Circuits, I explored how I use Twitter as a professional development tool. Over the past two weeks, we've looked at Filtering: A Challenge and Responsibility for Learning Professionals, and Curation: A Core Competency for Learning Professionals. In this closing post in my Learning Circuits series, I want to dig into curation in greater detail, describing what role technology plays in the curation workflow, and what it looks like for learning. Who Qualifies as a Curator? Part of the reason curation is such a popular term right now is that the definition of curation has been changed by technology. Years ago 'curation' was a specialized field that was found only in places like museums, performed by individuals who have studied their field and the techniques of curation for years. The definition of curator has expanded in recent years, largely in line with the expansion of social media technologies. The fact is, if you're reading this post on the Learning Circuits Blog, chances are you already are a curator, whether your realize it or not. This fact was proven to me in the most unlikely of places: my mother's dining room table. My family was visiting, and my mother was telling me that I don't post enough pictures of my kids on facebook. It was a little confusing; after all, my mother lives only a few miles away and sees my kids often. When I explained that, she replied "But my friends don't". What I didn't realize was that my mother often saw pictures of her grandchildren on facebook and clicked the SHARE button to share it on her wall. She was curating a story that was essentially titled "My Grandkids", and sharing it with all her friends. In the age of facebook shares/likes, Twitter retweets, and other social media sharing tools... anyone can be a curator. Let's back up a second though; perhaps saying the definition of curator has expanded isn't accurate, as it implies expanding a single definition to include a broader group. I do believe what a curator does for a museum is different than what a my mother does for her facebook wall. Perhaps it's two levels of curation, professional and amatuer, similar to the differences between a professional and amatuer photographer. Digital camera technology has advanced so much that even an amatuer can take high quality photos... but that doesn't make someone a professional photographer. Social media technologies have had a similar impact on curation, allowing anyone with an internet connection to become an amatuer curator. In fact, some would argue that technology has advanced far enough that the technology itself can curate. Automated Curation: Can a Computer be a Curator? Technology definitely aids in the curation process. Search engine optimization and filtering tools make it much easier for a curator to find resources he or she wants to share. But can a computer do the job so well that a human curator is no longer needed? Aggregation: Gathering and sharing relevant content. It releases the individual worker from needing to seek out the content. Filtering: Instead of simply aggregating content, filtering shares only those resources that are most relevant and valuable. Elevation: Recognizing a larger trend in the sea of seemingly less important content. Mashups: Merging two or more unrelated pieces of content to form a new message. Timelines: Organizing random pieces of content in chronological order to show the evolution of an idea. I think technology does a very good job of automating aggregation. In fact, I don't think a human is required at all for aggregation, unless the human is adding content from a source outside the data source being aggregated. Once you go beyond aggregation though, I believe the human is still required. Some would argue that computers can filter, and from a technical standpoint they can; I just don't think computers can do enough to filter in the context of curation. I often curate the resources from conference backchannels on my blog. What I do there is - by design - a very light-level of curation. My goal in curating backchannel resources is not to to provide a personally recommended list of resources. I could do that, but it would be a different post, with a different focus. After all, what I find valuable may be different than what you do. My goal in curating the backchannel is to collect the resources that most people likely missed, and to have them as an ongoing point of reference. I share all of the resources that could have value to someone that is interested. I group resources into categories, such as official conference resources, session specific resources, conference recaps, keynotes, etc. I seek out resources from outside the backchannel stream that have not yet been shared that I believe will add value. If a shared link is mostly self-promotional marketing - with little pass-along value - I filter it out. I do this with SPAM messages as well. I recognize themes in seemingly unrelated posts within the backchannel stream and link them. These are simple examples of things that a human curator adds that computers currently can not replace, at least not in most cases. For more advanced forms of curation like mashups and timelines, the need for human interpretation is even more critical. In short, I think the human is still a required part of the curation equation. That may change at some point though; the gap between what a human does and what a computer can automate continues to shrink. Social media usage continues to rise as a means for supporting social learning. Learning and performance professionals will need to be a part of the communities that emerge, possibly even serving as community managers. Technology could be used to analyze the sharing going on and spot potential trends (as a simplified example, consider a word cloud). As a curator, learning and performance professionals would seek out these themes and trends and elevate them to higher visibility across the entire organization. In a world where anyone can create content, our need to create content to address a learning and performance need is dramatically reduced. Learning and performance professionals would function as curators of content, connecting workers with existing resources both internally and externally that support performance. The definition of 'course' will likely change in the future. Currently course content is constrained and controlled, usually behind an LMS portal login. Courses are becoming increasingly open, allowing learners and workers to find and reference their own resources. Massively Open Online Courses (MOOC) are a step in this direction. In this open format, learning professionals can help curate the shared resources, highlighting those that resonate best with the objectives of the program. Curation is already here, and it's already impacting the learning and performance profession. The technology is already readily available to bring curation into organizations, and many forward-thinking organizations are already using it to their advantage. If you aren't already enhancing your learning and performance strategies via curation, you should be enhancing your awareness and skill sets in this area. It isn't so much a matter of 'If' your learning and performance programs will be impacted by curation; it's a matter of 'When'. The only question is: Will you be ready to support it? In my first two posts for Learning Circuits, I explored how I use Twitter as a professional development tool, and last week we looked at Filtering: A Challenge and Responsibility for Learning Professionals. This week we're going to explore filtering further, and explain how learning professionals will provide filtering services on an increasing basis. There are two primary ways that filtering will impact learning professionals. The first impact is in helping workers understand the need and techniques for filtering. For many, this need to filter is something they may not have considered before. However, in an age of ever-increasing data, being able to focus on what's important and what isn't is a required skill. It’s also something that needs to be learned. Filtering doesn't just apply to Twitter, it applies everywhere. In a world of 300 television channels, countless websites, and Reply-To-All emails, being able to narrow your focus on what is valuable is critical. So the first impact of learning and performance professionals is to assist workers with understanding and applying filtering skills; the second impact is of greater importance, and will become a core competency in the near future. That competency is curation. Consider the most common example of curation: the museum curator. This person does not create content in the traditional sense. He or she listens to what is going on, and finds topics that resonate with museum guests. He or she scours the globe for artifacts related to that topic, and organizes the artifacts in such a way that guests are taken on a learning journey as they experience the exhibit. Of course, museum curators are highly trained and educated in doing this. It is their specialty. How does curation fit into the existing world of organizational learning and performance? A large percentage of learning and skill building is done informally. Estimates show that upwards of 90% of workplace learning takes place outside of formal programs. Most actual learning takes place informally on-the-job, through coaching, mentoring, experience, and other sharing. This learning doesn't go through the training department, and it isn’t tracked by the organization’s learning management system. Capturing this type of learning has been a logistical impossibility (or at least very difficult) in the past, as it was taking place serendipitously, and without any sort of documentation. Interactions like water-cooler conversations, over-the-cubicle requests for assistance, and on-the-job coaching provide the majority of performance support, but usually happens in a vacuum, shared only between the participants that are present. In recent years, this social learning has expanded and exploded via online social networks. Networks like Twitter, facebook, or internal solutions like Yammer enable this social workplace learning to break through the constraints of face-to-face meetings. We can now share with counterparts across the globe almost as easily as we do across the room. Better still, learning that once was limited to those present in a face-to-face interaction can now be shared with the world. Learning and performance professionals need to discover where the information is being shared in their organizations, and tap into it. That networking resource is a gold mine for learning curation. The sharing taking place could be identifying new performance support needs, or it could be sharing new solutions. This all might sound overwhelming, making you think that you don't have the time to monitor every single learning experience that happens within your organization. That's not the expectation. What you're trying to do is identify the most common and valuable things that people share. Curation is less about the quantity of resources, and more about the quality of resources. · Aggregation: Gathering and sharing relevant content. It releases the individual worker from needing to seek out the content. · Filtering: Instead of simply aggregating content, filtering shares only those resources that are most relevant and valuable. · Elevation: Recognizing a larger trend in the sea of seemingly less important content. · Mashups: Merging two or more unrelated pieces of content to form a new message. · Timelines: Organizing random pieces of content in chronological order to show the evolution of an idea. Thankfully, there are plenty of tools that can help us with these tasks. However, there is still a human need in curation; a role that is built on a foundation of trust. When I follow a curator I do so because I feel that work the curator is doing is filtering on my behalf. I may not feel the need to seek out content as much if there is someone that is already providing pre-filtered content relevant to my needs. In the book Curation Nation, Steven Rosenbaum describes it this way: "Curation replaces noise with clarity. And it’s the clarity of your choosing; it’s the things that people you trust help you find." That’s the role learning and performance professionals are going to be playing more and more in the future. With content growing at an exponential rate, our need to create will slowly diminish. In its place will be the growing need to filter on behalf of workers; to curate the sea of content that is available and being shared and bring the most relevant and valuable to the forefront of worker attention. In my final post of this series I will drill down deeper into the process, exploring what technology can (and can’t) do to aid curation, and paint a picture of how I see curation fitting into the future of learning and performance. Thanks for reading - see you next week. David Kelly is the director of training at Carver Federal Savings Bank and Member of the ASTD National Advisors for Chapters. He is also the author of the blog Misadventures in Learning, where he discusses the future of the learning field and curates the backchannel of learning conferences. In last week’s Learning Circuits, I explored how I use Twitter as a professional development tool, and explained how doing so has helped me build a personal learning network. Personal Learning Networks (PLN) are, in many ways, both the past and the future of how people will learn. Training and formal education are important, but people have always learned more from sharing with each other informally. Technology has finally reached a point where it is no longer a barrier to this sharing, and can actually amplify it. The concept of a PLN is the natural evolution of this, enabling us to connect, share, and learn with others that historically were out of our reach. It enables us to reach across the globe as easily as we historically have peeked over the cubicle wall. But with the new technologies are new challenges. I often tell people about the value of PLNs, and share tips on how to get started. I notice a number of them taking the first steps towards building a PLN, but shortly thereafter abandoning the task. In almost all of the cases, the reasoning follows a common theme: being overwhelmed. It’s not so much that the technical mechanics of a tool like Twitter are challenging; it’s the world that Twitter opens up that can be overwhelming. The common metaphor for new Twitter users is that it’s like 'trying to take a drink from a fire hose'. There is so much information that trying to take it all in is impossible. This isn’t just a problem related to Twitter. In today’s digital world where anyone can be a content creator, the amount of information that is available can be staggering. Various studies estimate that the amount of digital data that is stored doubles every 18 to 24 months. Which begs the question: In a world of ever-increasing data, how do people find what they are looking for? How can all of the ‘noise’ be blocked out? Returning to the Twitter example, how can I find people to connect with in an endless sea of unrelated tweets? It all comes down to a single word, a word that is a critical skill in the digital world: Filtering. Looking through random data to find the information you need is time consuming and inefficient. Individuals need to develop filtering skills to block out the noise of everything so that they only see the information they are looking for. Many applications have tools that can help with this. Let’s revisit personal learning networks and Twitter as an example. Thankfully, Twitter self-filters. 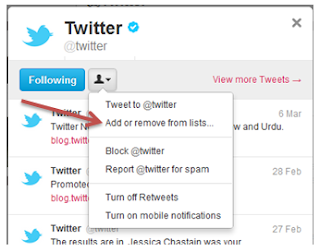 When you log into Twitter, your main feed will only show the tweets of those people you choose to follow. However, that really isn’t enough. As the list of people you follow increases, and the reasons for following individuals varies, your main feed may quickly become disjointed. That’s where lists come in. If you access your profile from the Twitter home page, you’ll see an option for lists. 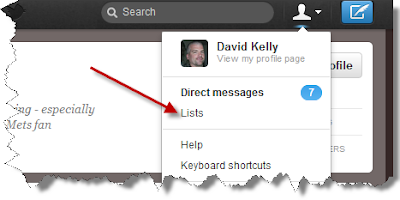 Creating lists is an excellent way to filter the tweet stream. 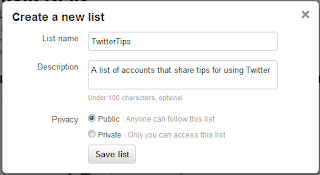 In the example below, I created a list called TwitterTips. 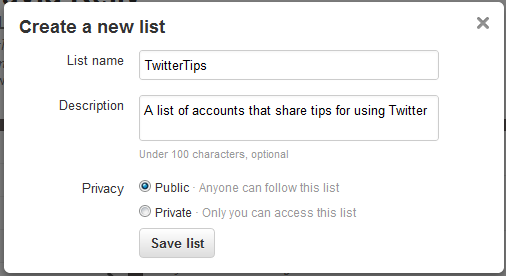 Once the list is created, I can easily add individuals to the list via their profile. That way, if I am interested in reading tweets from people talking about Twitter tips, I can go to the list I created and the feed will filter down to just the accounts I added to that list. Another filtering option is to search for hashtags. A hashtag is created when an individual adds a number sign before a word or series of characters. Twitter does not yet have a system where you can tag or categorize message. When a user adds a hashtag, they are essentially adding some sort of category to a tweet. ASTD is a great example. If I search Twitter for the ‘ASTD’, I will see tweets related to employee learning. However, I will also see tweets from people using ‘ASTD’ as an abbreviation for the word ‘assorted’ (a common practice on EBay). By placing the number sign in front (#ASTD), I am essentially searching on the category of ASTD. Many learning and performance professionals (including me) will add the #ASTD hashtag to tweets about our field because they know that people in the field are following the hashtag. Lists and hashtags used together are a great way to build your personal learning network. Following hashtags like #ASTD (or #lrnchat, another popular hashtag in the field) will get you exposed to other individuals you may want to follow and add to lists. This will filter the Twitter feed down to the information you find most valuable, and help you build a strong PLN. My first two Learning Circuits posts have focused primarily on building a personal learning network via Twitter. However, the underlying concepts of this discussion apply to the work we do as learning professionals as well. People learn most from sharing informally with each other. Social media tools like Twitter enable us to take the informal learning that traditionally took place only face-to-face and amplify it to a global scale. We are constantly learning from one another informally, and the pace is only increasing via social media. In a world where most learning is taking place informally, shared via social media tools that reside outside of LMS platforms, and are not tracked… what role does the learning and performance professional play? My next post focuses on that question, and introduces what I believe is the next core competency for learning and performance professionals: Curation. Last week during a discussion about design, Jeanette Campos asked me a fairly is simple question: What are the three artifacts that have shaped you most as a designer of creative learning solutions to complex problems? Immediately one word came to mind: Twitter. It isn't the tool itself that has been so impact full for me; it's the world to which Twitter opened up to me. I started my career as a learning and performance professional much the same way many in our field do: without any training or education on what it means to work in this field. It's a challenge for individuals and for the industry as a whole. It leads to a "We do what we do because it's what's always been done in this organization" approach to training. It's also a big part of why much of what we commonly define as training is nothing more than information communicated by those with expertise. I recall those early years well. I read a number of books and took classes to educate myself on how "Training" was supposed to be done. Still, I felt that there was something missing that I just couldn't put my finger on. It was like looking at a puzzle that was missing pieces, just enough so that you could not determine what the whole picture was supposed to be. Then I discovered Twitter. From that moment on, I have never looked at 'Training' the same, and each day the interactions I have on Twitter continue to shape me as a professional. To be fair, it was social media in general that enabled me to extend beyond the walls of my organization and connect with others externally in the field. I am active on all the major social media channels, and they each have their strength and weaknesses. I find that Twitter has the audience and usage that best provides professional development support for those in our field. Connecting with the community of learning and performance professionals on Twitter exposed me to new ideas and possibilities that enabled growth that wasn't possible before, simply because I was unaware of the possibilities that existed. I connected with a few individuals at first. Over time, that number slowly grew, and I started to become aware of a new type of network that has rapidly become one of the most important things in my life: my Personal Learning Network, or PLN. An important part of this concept is the theory of connectivism developed by George Siemens and Stephen Downes. Learners create connections and develop a network that contributes to their professional development and knowledge. The learner does not have to know these people personally or ever meet them in person. Every learning and performance professional should have a PLN. These networks are, in my opinion, the single greatest source of professional development and support available. They expose us to new ideas and ways of thinking, they provide us with more targeted and qualified results than a search engine query, and they enable us to connect and share with peers and experts. As the expression goes... None of us are as smart as all of us. Personal learning networks powered by social media networks like Twitter allow us to tap into this collective knowledge in ways that simply wasn't possible before. A well-cultivated PLN can also be your most powerful search engine, surpassing Google or Yahoo. When I am researching a learning and performance topic, my PLN is my primary research tool. Instead of a Google search, I send a question out to my network, and quickly receive answers to my query that come from the minds and experience of individuals I have chosen to connect with. In almost all cases, the resources shared by my PLN are better than those I am able to find from a standard Google search. So how does one build a personal learning network? In a word - participation. Search out people and topics that interest you and participate in discussions. Ask and answer questions. One of my favorite ways to introduce newcomers to PLNs is to invite them to participate in one of the Twitter Chats for Learning And Performance Professionals. There are a number of other great ways to build your personal learning networks. For more suggestions, check out Nuts and Bolts: Building a Personal Learning Network (PLN) by Jane Bozarth and Build a powerful PLN by Steve Wheeler. The digital age has provided learning professionals with an amazing opportunity via personal learning networks; and as with most opportunities, this one comes with a risk. PLNs aren't just for learning professionals; it's representative of a fundamental shift in the way people learn. People all around the world are forming PLNs, most without even realizing it yet. It's a natural evolution of our increasingly connected world. Put another way... It's the future of how the individuals whose performance we are responsible for supporting will learn. As such, our roles will need to adapt to accommodate this shift. Over the next three weeks, I look forward to visiting this future with you, and exploring the new skills - like filtering and curating - that learning and performance professionals will need to add to their skill sets. Thanks for joining me for the ride. David Kelly is a training director and internal learning and performance consultant. I first met David through Twitter. I was unable to attend last year’s mLearnCon, so I took to following the hashtag on Twitter. I quickly noticed that one person (@LnDDave) was compiling a lot of the information coming out of the conference. David was pulling so much information together that I thought he was at the event. Only later did I realize he was monitoring everything from afar, grabbing information from Twitter, the conference website, and blogs. That’s how I came to know David Kelly and his love of backchannel learning. If you don’t know David or are unfamiliar with backchannel learning, I suggest you check out his curated backchannels page, right now. David is doing something unique—for conferences he compiles all of the available content from a conference, including slides, presentations materials, relevant tweets, blog posts, pictures, and more and puts it all in one place. David is not only able to accurately live tweet the session he is in but also able to quickly scan and retweet other relevant tweets. If you’ve ever tried to do this, you know it’s a unique talent. If you’re unable to attend an event, combing through his backchannel material is the next best thing. I share his belief that this type of content curation is only going to become more and more important for learning professionals to understand and participate in. Over the next few weeks, David will be talking about Twitter and content curation—so please jump into the discussion. You can learn more about David over on his new, slick-looking website or by following him on Twitter @LnDDave.